Featuring thought leadership articles from a broad range of experts, The Road to Wellbeing looks at overcoming macho culture, self-reliance, dealing with life-changing obstacles and battles with mental health. Are lunch-breaks important for staff health? Risk assessment – What are you doing wrong? The eBook also recaps keynote speeches from Safety & Health Expo, with inspirational speakers shedding light on moving, personal experiences, and connecting their stories’ to the larger world of wellbeing. Dame Kelly Holmes spoke of her battle with mental health issues, Professor Brian Cox raised questions about human resilience and Simon Weston CBE brought his audience close to tears in discussing the significance of self-belief. Beyond being case-by-case examples from courageous individuals, these singular lessons can be applied to whole organisational cultures. Discover the practical steps you can take to cultivate an environment of wellbeing and listen to the latest conversations around health and safety. Get your free copy today by filling out the form opposite. 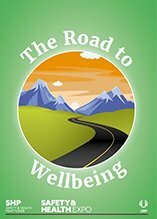 The Road to Wellbeing eBook – British Safety Council Featuring thought leadership articles from a broad range of experts, The Road to Wellbeing looks at overcoming macho culture, self-reliance, dealing with life-changing obstacles and battles with mental health.